» What Is Email Still Good For? Mobilize Mail > What Is Email Still Good For? What Is Email Still Good For? 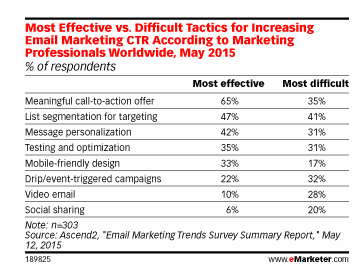 Email as a marketing channel has got a lot of competition in 2015. Numerous social media networks, instant messaging, chat and discussion forums are all vying for the marketing dollar. So how are businesses measuring the success of email marketing in 2015 and why do Marketers still love it? eMarketer suggests email is the business channel of choice for communicating with prospects and customers. It’s also the channel of choice for lead generation, customer acquisition and retention. Everyone loves email – just look at how social networks use email to pull people online arguably they are probably the top users of email. How many emails per day do you get from Facebook? It would be interesting to know how they’d perform without it. Businesses measure email’s success by the CTR (click through rate) and while it delights it also causes a lot of headaches. Low CTR is a constant challenge however it can be turned around. In an eMarketer report – CTR was the leading challenge for businesses ahead of ‘lack of strategy, lack of quality content and an inability to segment lists. So what can we work on that will improve the CTR or CTOR (click through to open rate)? Check out this graph illustrating measures that can be taken to improve CTR. Email marketing is clearly still the channel of choice for marketers and businesses and it’s very effective when it’s executed well. Recommendation: Seek input from email marketers (and if your account is with us we will assist you). Conversion rates can be improved by email design, content, list segmentation, call to actions, email triggers. An experienced pair of eyes reviewing your efforts and providing feedback will improve the results. Email in 2015 is still good for your business. Remember email is the preferred channel for most consumers so don’t be shy – use it regularly and reap the benefits.